Here's an incredible story for you. I've been meaning to post it for a while but am easily distracted by shiny bookcases and cool new book paraphernalia, so it's been stuck in my to-post file for longer than I intended. Helene Hegemann has done what most writers only dream of. 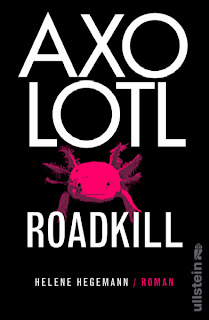 Her first novel, Axolotl Roadkill, is a bestseller that received rave reviews from critics and readers alike, and she is now a finalist for a major literary prize. Pretty good for a 17 year old. Unfortunately, as with most modern-day fairy tales, it's a bit too good. A blogger discovered that large portions - in one case even an entire page - of Hegemann's novel had been lifted from a different, lesser-known work. Outrage naturally followed and grew when Hegemann's book was shortlisted for a $20,000 prize, with one jury member admitting that the plagiarism charges were known to the judging panel. Hegemann appears unrepentant, only apologizing for not being more transparent about her sources. She even went so far as to dub her actions an act of "intertextuality." "Very many artists use this technique ... by organically including parts in my text, I am entering into a dialogue with the author." She added, “There’s no such thing as originality anyway, just authenticity." I'm flabbergasted. Not just by Hegemann's sheer cheek in stealing someone's work and her smug spouting of pseudo-intellectual crap, but also by the people who continue to support and even champion her. I, quite frankly, think it's disgusting. James Frey was forced to adopt a string of pseudonyms under which to write after his Pieces debacle, yet this girl continues to receive ever more adulation. What gives? We just talked about this case in a class of mine. It's interesting for sure, and complex too. With YouTube and home editing and whatnot, many argue that we live in an age of 'remix culture', where intellectual property is becoming an increasingly contested idea. So the author's points might stand here. The only thing that commercially benefiting from plagiarized work changes, in terms of artistic ethics, is the profit margin. Remixing, fan tributes, sampling, quoting, etc., are accepted and always have been within the arts community, so long as artists provide citations that refer to the original or influential works. Using a Spencerian sonnet's rhyme scheme or quoting The Faerie Queen isn't plagiarism, but copying an entire page from it without citing is. There isn't any grey area here. Everyone knows a fan remix is a fan remix, I understand. However, if a fan were to self-publish their Harry Potter fan fiction, you can bet that they would get a letter from J.K. Rowling's lawyer. Something similar has happened already, and the courts upheld her claim of intellectual property rights. The waters are much less murky in Irish and British courts, and I expect them to clear up here in the US, as well. I really don't think it's that complex. She lifted a page of someone else's work without citing it, referencing it, mentioning it at all. Then she got caught, and suddenly all this nonsense about "intertextuality" and "authenticity" came tumbling out. I highly doubt she would have volunteered the fact that she had sourced her writing from elsewhere had someone else not discovered it. Also, try pulling this in class next time you have a paper due - you'd get expelled. If I tried it at work I'd be fired. If you present material as your own when it is not, you are not doing something cool or revolutionary, no matter what spin you give it - you're misrepresenting yourself while ripping off the original source. Her publisher recognizes that, which is why they have actually paid the publisher of the original work in order to make this all legitimate. If lifting/remixing/sampling/whatever-the-hell-Germans-choose-to-call-plagiarizing-now other work was even faintly acceptable in the publishing industry, Hegemann's publisher wouldn't have ponied up that make-it-right dough. Also, people really should look up the actual literary definition of intertextuality. She's basically using the term in a deceitful way, and her bluster becomes pretty evident when you read about the actual literary element. It's the equivalent of a woman killing a man out of dislike for his gender and then claiming it wasn't murder - it was feminism. Sounds confusing, right? That's because it doesn't make any sense - and neither does her excuse.